SAP Business One is used by more than 60 000 companies worldwide, serving more than 1 000 000 users. Being on the market more than 20 years with constant research & development, SAP Business One was tailored in such a way so that small and medium businesses to get maximum value from integrating, cross-connecting and using its business & accounting data. SAP is the name of the multinational software corporation based in Germany, as well as the name of the business software solutions for all types and sizes of companies. From 1973 SAP company is sustainable on its main goal: to help businesses worldwide to integrate its data and to improve performance. Today ERP systems created by SAP are one of the most innovative, reliable and well-known worldwide. SAP is considered first company worldwide for ERP solutions. Because of that giants like Apple, Walmart, Shell and many others made their choice for SAP solutions. Learn more from SAP Corporate Fact Sheet about the world’s largest provider of enterprise application software here. SAP Business One is a right first or second step for small and midsize companies on their growing and extending path, providing excellent cost/value ERP system for operational and strategic performance. From our 14 years’ experience of SAP Business One implementation, there is still no any alternative on the market, especially from the point of view of stability, security and adaptability. Nowadays, SAP Business One is probably the best time-proved ERP solution for small and midsize companies worldwide. It includes more than 500 industry solutions, being sold and available in 170 countries in 27 languages. It is interesting that majority of ERP innovations originally are invented by SAP R&D global team. What Is the Importance of SAP Business One is So Vital To Your Organization? In Data processing SAP stands for “Systems, Applications & Products,” In the present digital age, businesses of diverse complexities and capacities find SAP vital to their organization’s overall growth. Today, companies of varying sizes are entrusting SAP system for day-to-day operations and reporting. Do you know SAP is present in over 120 nations across the globe? 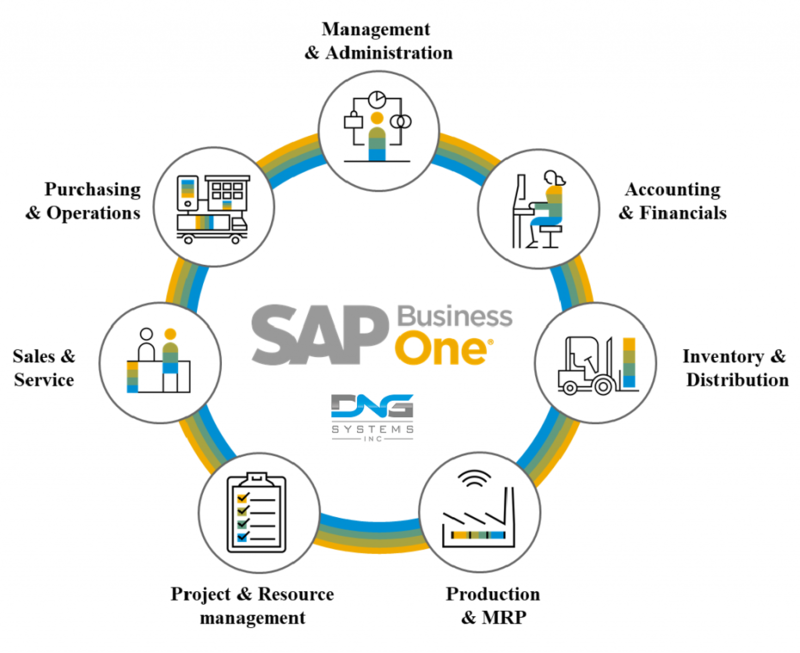 Here, we list why you need to reach out to one of the most trusted SAP Business One solution providers-SAP Business One is a one-stop solution which takes care of an organization’s diverse functions, ranging from human resources to the finance. With SAP Business One, as an organization you have the luxury to store your business critical data at a single place, thus saving productivity hours of your company. One of the top-most benefits of SAP Business One is that it easily adapts to the needs to your organization seamlessly. The SAP Business One provides a holistic 360 view thus helping your business to improve the decision making procedure. The basic structure of SAP Business One is simple, logic and practical. Functional modules are designed to cover the typical functions in any company, from which the most widely used are Financials, Sales Opportunities, Sales – A/R, Purchasing A/P, Business Partners, HR, Banking and Inventory (Exhibit 1). Special customized quality add-ons are offered by SAP to complement any specific business requirement. What is the final value for my company? SAP Business One is much more than a solution for your management and accounting data. Implementation of SAP Business One brings a completely new level and culture of aggregation, processing and usage of your data, setting a proactive behavioral change to data-centered decisions. Automatization of business processes increases productivity and business performance. This is an important result of digitization of your company when your investments are returned in all aspects of your business. Ask for a Free of Cost Project Estimate Now! It’s not the moment to think or rethink, partner DNG systems Inc, one of the top-ranked SAP consultants in Los Angeles for high-end, industry specific SAP consulting and implementation services. Take a deeper look how we may help your company to grow with our sense-of-belonging approach to your unique business. DNG Systems will use the information you provide on this form to get in touch with you regarding your query. If you would also like to receive our informational emails including product updates, new features and upcoming events, please tick this box. You can unsubscribe at any time.